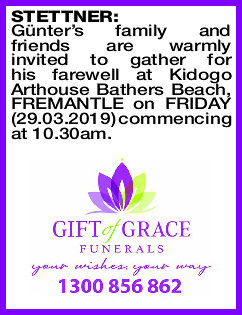 Günter's family and friends are warmly invited to gather for his farewell at Kidogo Arthouse Bathers Beach, FREMANTLE on FRIDAY (29.03.2019) commencing at 10.30am. 18.11.1952 - 17.3.2019 Died peacefully at home surrounded by his family. Much loved by Sukey and his children, Scott, Nina, Anna and their respective families.